Featured in Lucky Magazine. All feathers have been cleaned and disinfected and individually wrapped with tarnish resistant silver or gold plated wire. 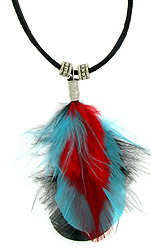 Each necklace is available with an adjustable 20 inch brown or black suede cord that ties in the back or an adjustable 16-18 inch sterling silver chain. No birds are harmed. 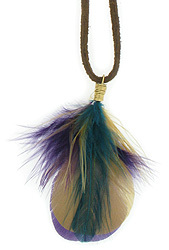 Each feather is one-of-a-kind and will vary slightly in color, size, and shape. The lengths that are provided are close approximate ranges and may vary a little shorter or longer than the given lengths. If you have any questions, please contact me before you make a purchase. 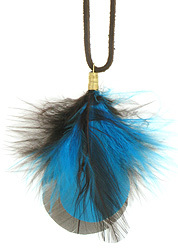 Arte Designs feather necklaces have been featured in Lucky Magazine. Updates will be added on my Jewelry On TV and Jewelry Press pages and also on Facebook and Twitter. 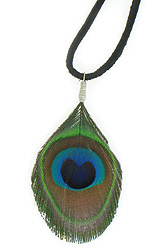 Why don't I put a clasp on the back of the necklaces with suede cords? It's because my customers want their necklaces to be adjustable, so they can tie it at different lengths and fit different necklines. 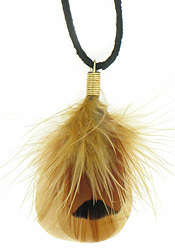 The 2 beads on the suede cords can be worn in the front or the back of the necklace. 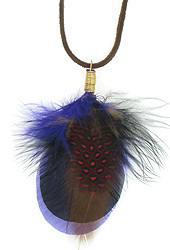 Feather Necklaces, Peacock Feather Jewelry.